A smear of family toothpaste containing a minimum of 1000 ppm fluoride is fine for children under 3. From 3 to 6 years, kids should use a pea-sized amount of toothpaste containing 1350 to 1500 ppm fluoride. If you’re unsure, ask your dentist for advice. Toothpaste is not meant for eating, so don’t let your child lick or eat toothpaste from the tube. What age can children brush their teeth on their own? Kids don’t have the same dexterity as adults and will need help cleaning their teeth until they’re about 7 years old. If they seem to be managing well on their own, you can let them do all the work and just watch to make sure they’re doing a good job and brushing for long enough. Choosing their own toothbrush will help kids want to brush. Turn going to the chemist to find a toothbrush into a treat. Earning stickers and sticking them on a wall chart is something all children enjoy. Especially if they get a reward when they’ve earned enough. Pick one of your child’s favourite songs and get them to hum it as they brush while you sing along. It will take their mind of the task at hand and help them brush for long enough. 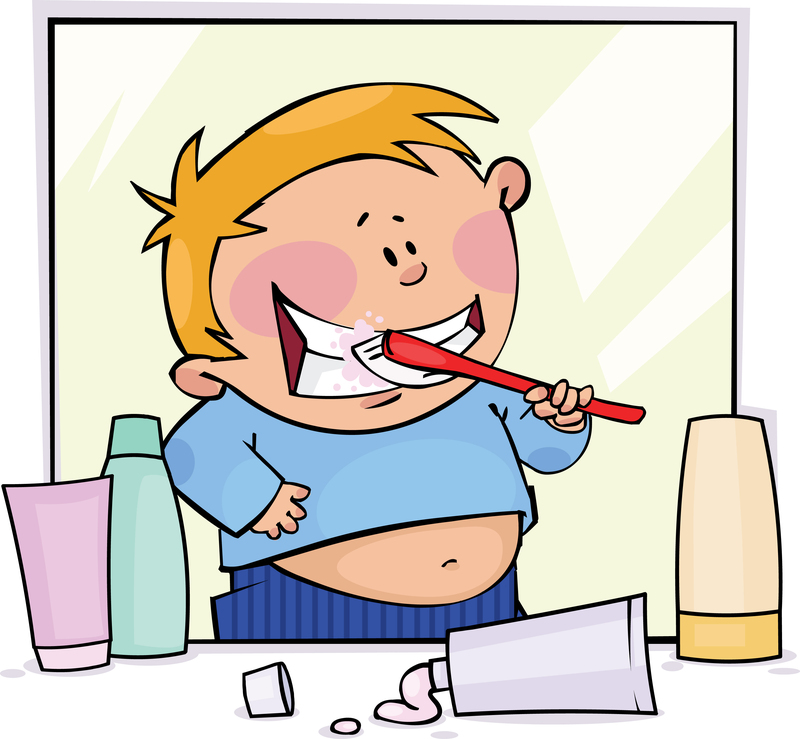 Brush your own teeth along with your child so they can see that even mum or dad has to clean their teeth too. Toddlers who won’t let you brush their teeth will often find it fun to have a go at brushing yours instead. Once they’ve had their “turn”, they will probably let you brush their teeth. Kids love stories. Buy a picture book about brushing your teeth or make up your own. It could be a tale about the tooth fairy or defeating the mini plaque monsters in your mouth. When should kids start having checkups at the dentist? There’s no set age you should start taking your child to the dentist. Instead, you should book their first checkup as soon as their milk teeth appear. Starting early means your dentist can spot problems straight away. And having checkups from a young age will get your child used to going to the dentist. Dental care is free on the NHS for children at Grosvenor Place in Mold. What sweets and fizzy pop bad for kids’ teeth? Sugary sweets and drinks are irresistible to children. But chocolate, sweets and sugary drinks are not a necessary part of a child’s diet. The sugar in these products causes acid in the mouth that damages tooth enamel and encourages tooth decay in children. Help your child stay healthy by keeping them away from junk food and sweets as much as you can. What snacks can I give my child instead of sweets? Raw vegetables and fruit are natural foods and the best snacks you can give to children. Kids like tangerines and bananas or pieces of cucumber and cherry tomatoes. You can also give them plain popcorn or rice cakes. What drinks are best for my child’s teeth? After 12 months of age, the best drinks you can give your child are plain water or full-fat milk. “Baby juices” and fruit juices are marketed at parents and children. But these drinks contain tooth-eroding acids. Once your child has a taste for sweet drinks it will be hard to persuade them to drink water or milk instead. So try to avoid these drinks as much as you can. Is thumb-sucking and dummies bad for children’s teeth? Sucking their dummy, thumb or fingers won’t harm teeth but it might change your child’s ‘bite’. An open bite (where teeth have moved to make room for a dummy) could cause speech problems. Try to get them to stop before they start to get their second teeth. Perhaps before they start school or at least by about 5 or 6 years old. For extra advice, or to book a dentist appointment for your little one, please call Grosvenor Place Dental Practice in Mold on 01352 753777.